If this were a review of a bar rather than a restaurant then what follows would be a good deal more positive. 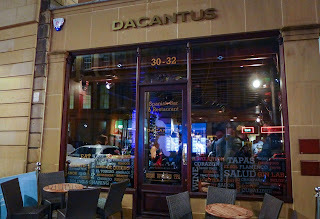 Dacantus in Newcastle’s Grey Street is a really nice bar. 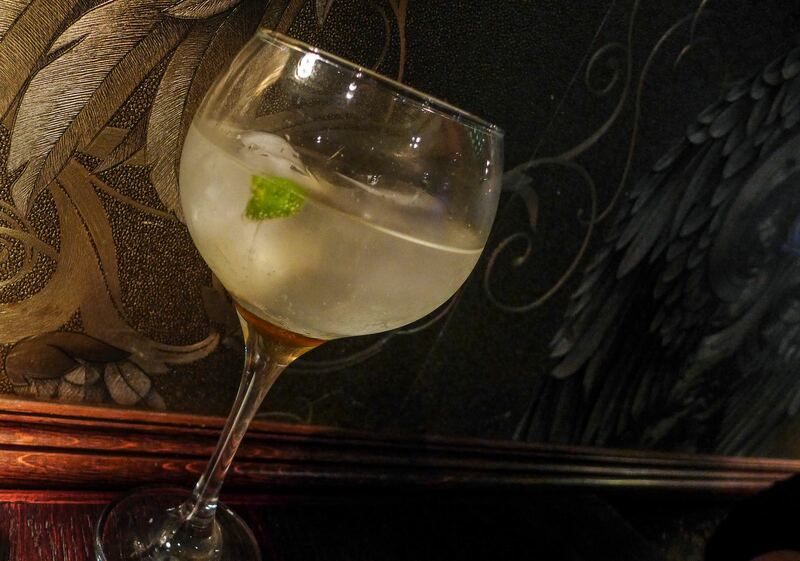 They serve good wines by the glass and a dizzying array of carefully made gins and tonics. The interior is a dramatic contrast of hefty dark woods and bling-y gold textured wallpaper. The bar itself is a vast chunk of marble and the nice people who tend it really know what they’re about. I would go as far as to say this is an excellent bar. 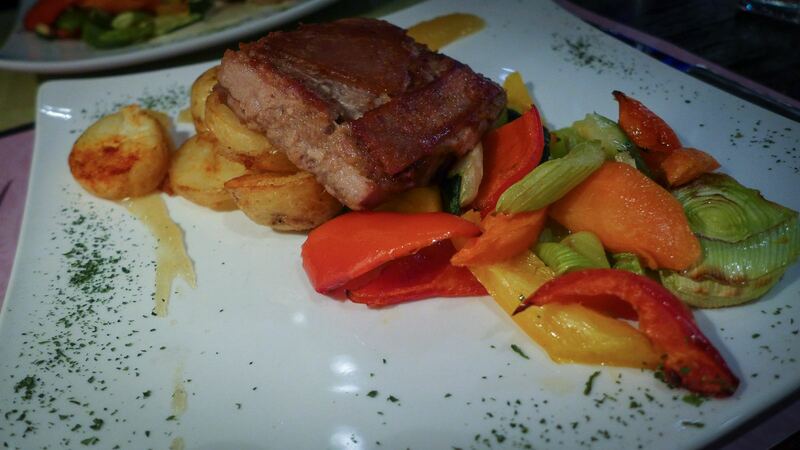 However, they also offer a full food menu, which means that they are a restaurant. And I’m a restaurant critic. Oh dear: nice bar, shame about the food. We visited early on a Friday evening, just as the post-work imbibers were vacating their seats, to be replaced by those who are unequivocally “out” for the night. Perched at a high table on the opposite side of this narrow strip of a room from the bar, we looked at the list of dishes. Everything about it triggered my “this is going to be dodgy” klaxon. Dacantus claims to be operating a “signature kitchen”. I have no idea what this means. Whose signature? The menu offers no clue. It’s a broadly Mediterranean, vaguely Spanish mixed bag with a sprinkling of geographically non-specific curveballs. Chicken “Voronoff” style (their quote marks) had me scuttling off to Google where I found the story of a French surgeon, Serge Voronoff, who in the 1920s gained notoriety for grafting bits of monkey testicles onto the same organs of adult men in order to increase their virility, and so earned the gratitude of London’s male dining fraternity by having a sauce created in his honour by the Savoy Hotel. You’re welcome. 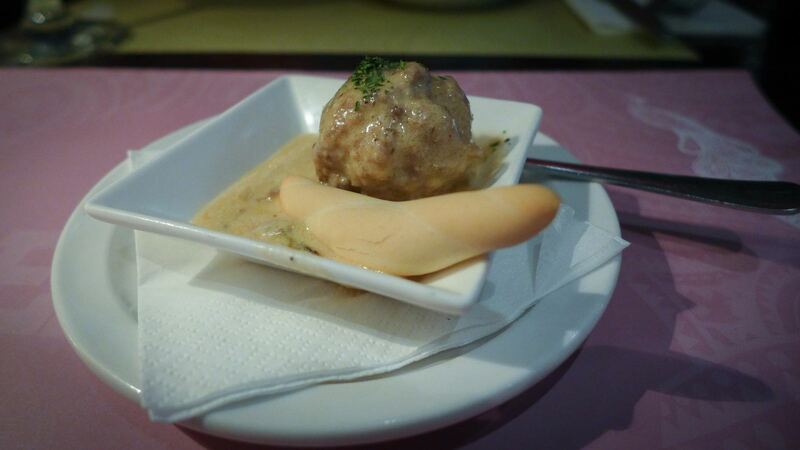 Unfortunately the dish itself was less exciting than its history: these monkey glands did nothing for my own virility. 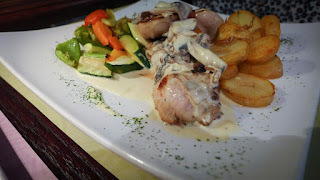 Slightly dried out batons of chicken breast were smothered in a cream sauce that had the boozy tang of Worcester sauce and brandy and were accompanied by some average roast spuds, the whole festooned by a green blizzard of dried parsley. This last feature set off another klaxon: why dried parsley? 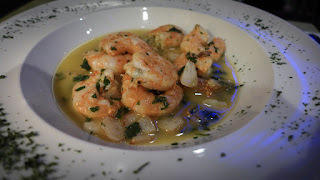 Mrs Diner’s starter of prawns in a wine and garlic butter sauce was more successful, benefitting from plenty of allium funk, but, again, pointlessly decorated by more green chaff. At this point, just as I was enjoying a delicious concoction involving a New York gin aptly called Glorious, and some tonka beans, I started to realise what kind of food they should really be serving here. Simultanously I was coming to the depressing conclusion that I had ordered exactly what they shouldn’t be serving. My slab of suckling pig had decent flavour, but was overcooked to the point of aridity and came with more of the potatoes I thought I had said cheerio to when our starters disappeared. A melange of roughly chopped vegetables - peppers, carrots and leeks - which, frankly, did not belong together in any frying pan, arrived on my plate. Crunchy leeks are no more fun than monkey testicles. Was there dried parsley on the plate? Does the bear relieve himself amongst the conifers? 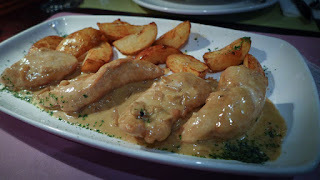 Mrs Diner was treated to a similar confusion of veg on her main course of chicken stuffed with dates and nuts. The fruit had at least kept the bird agreeably moist, as did its dousing in another unspectacular cream sauce. Puddings were a clear high point. 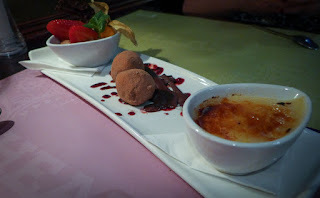 We shared a triptych of crème brulée, soft cheese and cacao truffles and some chocolate mousse. These were all competently made, the burnt cream being smooth with a delicate sugar topping and the chocolate mousse broodingly dark. All benefitted handsomely from a lack of dried green stuff. Here’s the frustrating thing: given that this is a really nice bar, you’d think it would serve really nice food. Instead, what arrived was by turns staid, tired and a bit odd. If I owned this place, I’d probably take a clue from the sign on the door that reads “Spanish bar and restaurant”, and hire a signature for the kitchen who knew how to cook Spanish food. 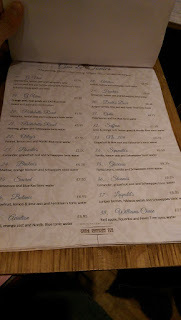 Perhaps a regularly changing tapas menu of maybe 6 to 8 dishes: a couple of favourites, and a few more interesting choices. 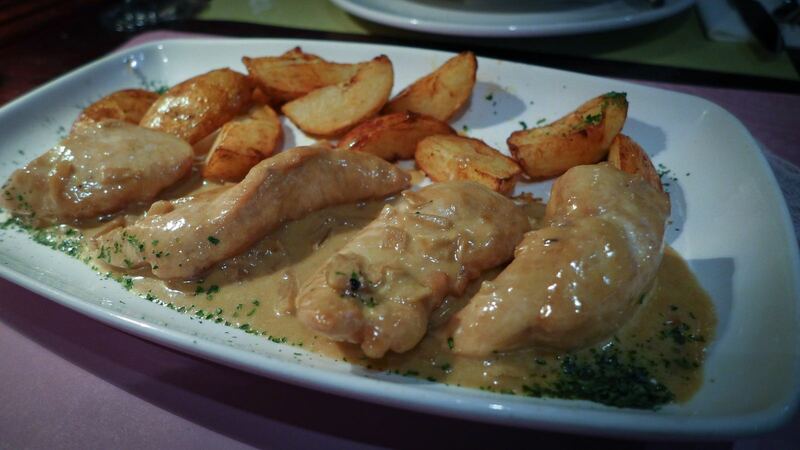 Some really good croquettes, plates of the best Iberian hams, carved at table or at the bar of course, some quality Spanish breads and oil and perhaps a chorizo-spiked stew. I’d certainly invest in some serious prawns - Carabineros, or similar - and grill them with nothing but oil and lemon. I’d do away with most of the chairs, especially on weekends, when the waiting staff have the unenviable task of slaloming between hordes of drinkers in order to deliver large square plates of average food to the punters at the far end of the bar. I’d keep the wonderful selection of gins, add a few finos and manzanillas and Bosh! - Newcastle would have a real Spanish wine bar. As I’ve written before, the North East is crying out for a serious ham and sherry joint and Dacantus should be it. Alas, it is not.